Just a quick, fun post today. Since it is Halloween, I thought I’d get into the spirit and post a different form of my art… I think I should use pumpkins as my new medium. 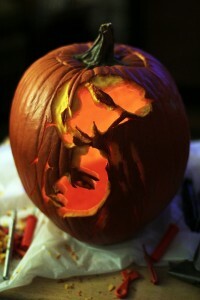 I carved a Twilight pumpkin, which, yes, I know I’m not the first nor the only one to do one. However, I can say that mine was carved based off of my own drawing. For those of you who are artistic, here’s a little how-to: I first drew a simple drawing of the photo from the book. No shading or detail. Then I used orange, light orange, and yellow colored pencils to map out the positive and negative areas. The light orange was used to mark the “gray areas” since you can carve just the outer surface of the pumpkin to get those middle tones. I thought I could use my drawing as a template, but that was getting confusing, so I used it to cut out the major areas- ex. Bella’s cheek. After that, I just set the drawing down by the pumpkin and used different tools to remove other areas and do the details. I had some actual pumpkin carving tools, but those were not as sharp and precise as I needed. So I used an X-act0 knife to do a lot of small details and a mat knife to carve into the surface. I used a steak knife to cut out large areas. I even used my fingernails to pick out some small parts. Whatever does the job. Oh, and I used a spoon to scrape over the “middle tones” and smooth them out a bit. And that’s it. Happy Halloween! The latest painting from my In Our Veins series has just sold. I just finished it a matter of weeks ago, so I feel like it’s still hot off the easel. I love working with small paintings given that I use such tiny brushes. Sometimes it can seem a bit daunting to finish a large painting when it consists of meticulous dabs of paint. That said, these small sizes are great for me and great for new collectors (or those with lots of art and not enough space!). Untitled was the last of my 4″ x 4″ paintings, but I will be creating more at this size. I will be posting them here, but I give my newsletter subscribers the first viewing, so if you would like first dibs, be sure to sign up here: www.amyguidry.com/contact.html. Follow me on Twitter and you can also “like” my Facebook Fan Page to get my latest updates. Another In Our Veins painting has found a new home. My painting Sequence has sold and is already at its new residence. This is an acrylic on canvas, 6″ wide by 12″ high. The In Our Veins series deals with the life cycle and the role of every living organism in it. 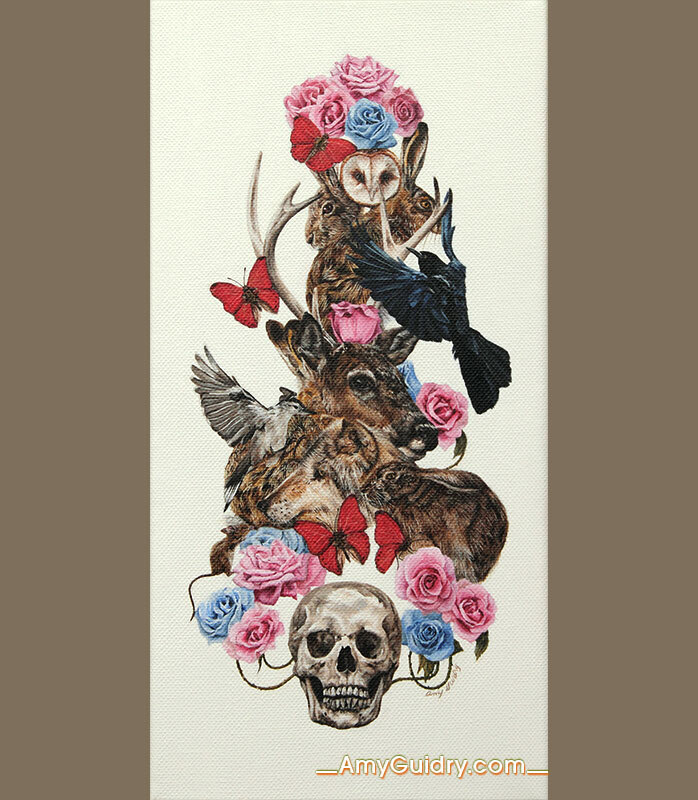 With Sequence, life and death are represented with new life- plants, animals, insects- leading one to the next, from the skull. The animals loosely follow a natural hierarchy, many of them following each other in the food chain. The roses were part of the original sketch and seemed appropriate given that we use roses to celebrate life as well as to honor those that have passed. You can read more about the series as well as view a larger image of Sequence here. 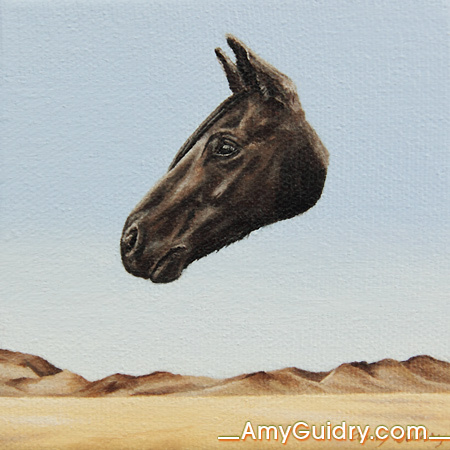 Sign up for my monthly newsletter to see my latest paintings, exhibits, and news at www.amyguidry.com/contact.html. Also “like” my Facebook Fan Page to get my latest updates. A little while back, I wrote about goals and formulating your strategy to meet them (which you can read here). I had also mentioned that part of that process involves revisiting your goals and reworking them. So as I am revisiting my own, I thought it would be helpful to go through some steps and specific examples. – Out of the tasks that you’ve completed, what were the results? Positive? Did they help you get any closer to your goal or not really? If it’s the latter, you may want to alter it or even consider removing it from next year’s goals. Example: You get your work featured on a website you’ve been submitting to and it doesn’t lead to any website hits. Maybe the website is not worth your marketing efforts so you might not want to submit in the future. Maybe reconsider the types of websites you are submitting your work to. – Of the completed tasks with positive results, what worked the best? What resulted in the most contact/sales/exhibits, etc.? When you are making your new goal list for the following year, be sure to include those tasks again and add similar goals to increase those results. Example: If a certain exhibit yielded many sales, what contributed to this and how can you do it again? Show at the same venue next year, do the same type of promotions and broaden the range, or maybe the exhibit was during the holidays. – What can be improved upon? Maybe some tasks are not quite what you expected but still have some benefit. Is there anything you can do to improve this or is it time to cut bait? You want to spend your time on the things that are improving your career and get rid of the time-wasting tasks that are of little or no benefit. – What is missing from the list? Before completely writing off one of your goal tasks, is there anything you may not be doing to help bring that goal to fruition? Example: If an exhibit didn’t go as well as expected, was there anything on your end that should have been done to make it a success? Did you attend the opening? Did you promote the exhibit? Did you send out press releases? – Focus on your “best bets.” Maybe you are hoping to get an exhibit or find gallery representation. While this is a great goal, you should focus your efforts on the venues that will be the best fit. Example: If you are an abstract painter, you should focus on galleries that predominantly show abstract work. What sells well for the gallery? Where are they located? What direction are they going in? Just because it is a well-known space, doesn’t mean it’s a good fit unless it meets these criteria. Focus on the ones that do. – Is there anything you can delegate to someone else? Some tasks are necessary, but may rob you of the time you need to complete your high-priority goals. Do you have an assistant that can take care of such tasks? Or can you afford to hire one? Do you have a business partner that can handle certain tasks better than you can? Once you evaluate what tasks are best suited to your career goals, it will become easier to work on future goals. You will eventually streamline your goals and learn what to focus on and get the best use of your time. One of my latest additions to the In Our Veins series has sold. Means to an End was shipped to its new home in Florida. It is an acrylic on canvas, 4″ x 4.” The In Our Veins series, in short, explores the connections between all life forms and the cycle of life through a surreal, psychologically-charged narrative. You can read more about the series on my website as well as view a larger image of Means to an End at this direct link: www.amyguidry.com/means_to_an_end.html. 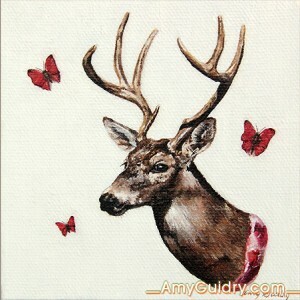 For my latest news and paintings, sign up for my monthly newsletter at www.amyguidry.com/contact.html and follow my Facebook fan page. I have just added a new addition to the In Our Veins series. Untitled is the latest small painting to be added and the second one at my new 4 inch by 4 inch size. I like to work in a range of sizes depending on the amount of visual information and am currently working on a larger piece. These new small sizes are the smallest works I’ve ever done in my career and at $100 or less, they appeal to a range of collectors, new and old. If you’ve been following my work, you know that I do not sell “prints” and only offer original, one-of-a-kind paintings. I conducted a poll through my Facebook Fan Page and found that everyone was interested in owning original art, whether small or large, rather than a reproduction. As an art collector myself, I happen to agree. I like knowing that the work is original, in addition, I love to see the texture of the paint and the 3-dimensional quality of it. You just can’t get that in a [giclée, print, copy]. But not everyone can afford art- even if it’s only $500- so I have always offered small works to fit everyone’s budget. And even though my new series has had a change in technique and materials, thus more time-consuming, I have worked with the subject matter to keep the price low and still maintain a high value. Hence my latest painting, which you can see larger on my website at www.amyguidry.com/untitled02.html. 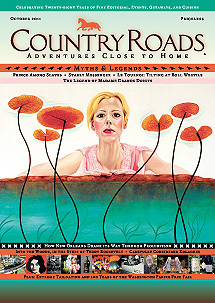 I recently had a nice surprise- I did an interview for Country Roads magazine and my painting “Introspective” is on the cover of their October issue. The issue’s theme is “Myths & Legends” so my New Realm series was a good fit. “Introspective” is an acrylic on canvas, 40″w x 30″h, and even though it is sold, there are several available paintings from the same series. New Realm, in short, challenges the antiquated views of women as often seen in fairy tales. Using a surreal backdrop, it is a modern tale which presents the heroine as a strong and courageous woman. To view a larger image of the cover, as well as read the interview with James Fox-Smith, go to this direct link: http://countryroadsmagazine.com/2011/october-2011-issue. I have some exciting news to share even though this event is still a little ways away. I have been invited to be one of four featured artists during the Louisiana Bicentennial at the Paul and Lulu Hilliard University Art Museum. The exhibition is scheduled for the Fall of 2012 and will feature works by Melissa Bonin, Linda Trappey Dautreuil, Troy Dugas, and myself (Amy Guidry). As I mentioned, the exhibit will be during the Louisiana Bicentennial, which marks the 200th anniversary of Louisiana’s attainment of statehood as the 18th state in the Union, and is celebrated with events throughout the state. 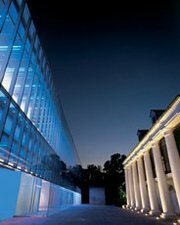 I will be posting more information closer to time- the exhibit will be held in Fall 2012 at the Hilliard Museum in Lafayette, LA. To receive monthly updates of new work and upcoming exhibitions, interviews, etc. sign up for my newsletter at www.amyguidry.com/contact.html.